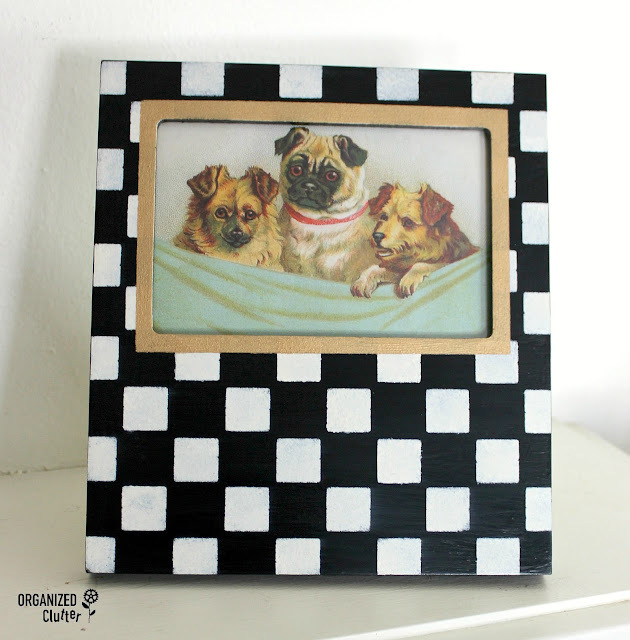 Picture frames are always plentiful at the thrift shops, even in February! This frame is made of resin or hard plastic, and it holds a 4" x 6" photo. The back of the frame has a chevron pattern. 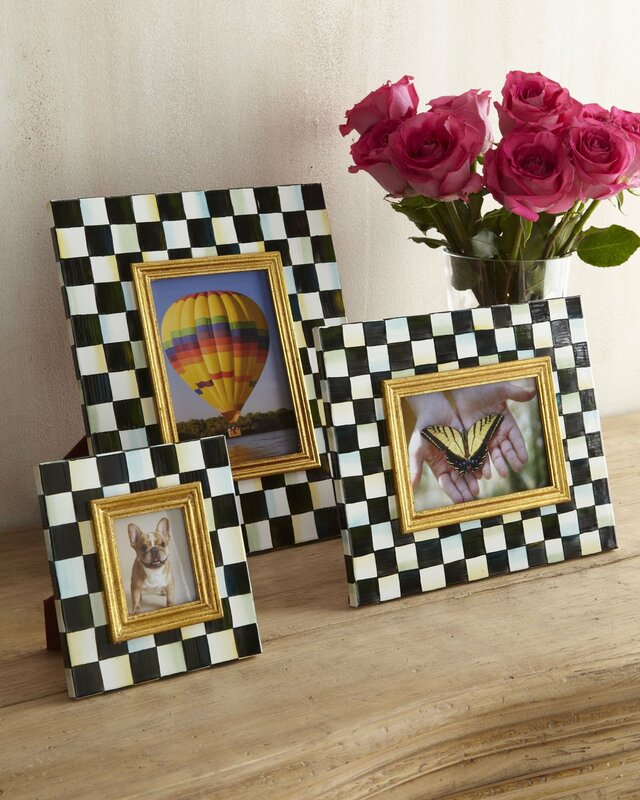 These are MacKenzie-Childs Courtly Check Enamel Frames currently for sale on Amazon. 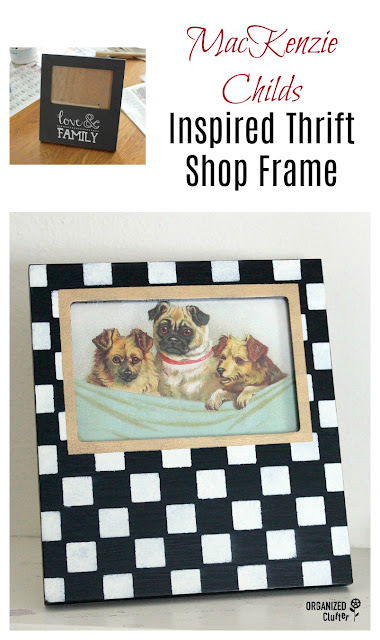 I was inspired by these frames to upcycle my thrift shop frame. The first step was to paint the frame on the front and back of the frame with two coats of Fusion Mineral Paint in Coal Black . I like Fusion Mineral Paint's adhesion to almost any surface. My only complaint with Fusion is that it sticks too good. It's hard to distress. I won't be distressing the frame, so not a problem. Use a Zibra Paint Brush to minimize brush strokes. I live in a very small town with limited shopping. When I hit larger cities, I always visit Joann Fabrics, Michael's, and Hobby Lobby. And I always check out the stencils. I found this package of Artminds 26 paper pattern stencils at a Michael's store. They are out of stock online, but you can check for availability at stores. They are very similar to the Folkart Value Paper Stencil packs. You have to punch/press them out on the perforated areas. 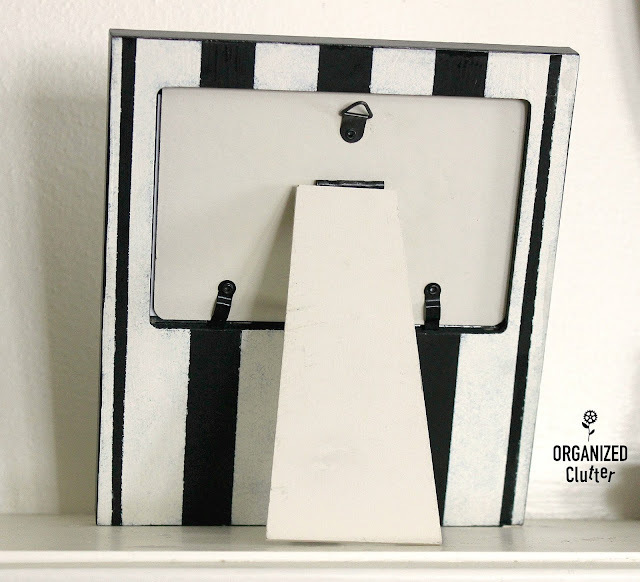 One of the 26 stencils in the Artminds Pattern Package was this check stencil. It's not buffalo check stencil! LOL! I promise. I used it on the front of the frame. I centered the stencil on all sides of the frame, (make sure the checks overlap the edges about the same) and taped it in place over a couple of the checks with blue painter's tape. I used Ceramcoat Acrylic Paint in Light Ivory to stencil the checks. When the checks were dry, I taped off a small area around the frame's photo cutout. I then stenciled the taped off area with my trial size Rust-Oleum Metallic Accents Paint in Soft Gold. It took three coats of stenciling to get the look I wanted. I sealed the frame with three coats of Varathane Water-Based Polyurethane in Satin Finish . My inspiration frames had a glossier finish too. 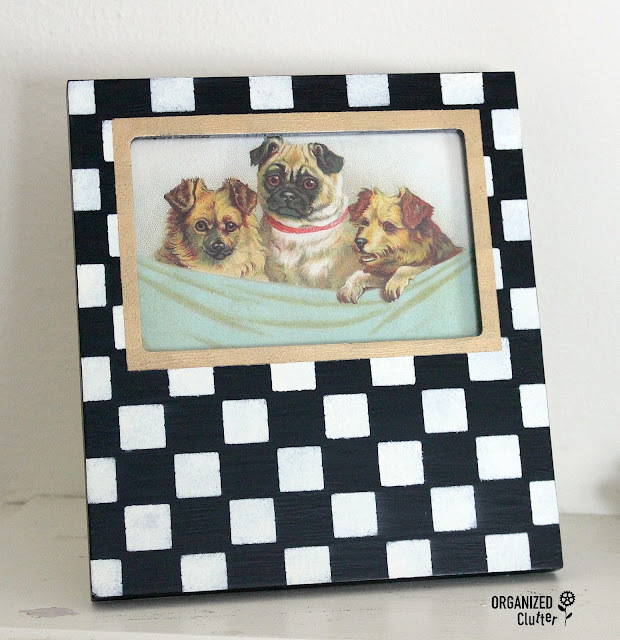 I printed a vintage image from the Graphics Fairy of three puppies, and put it in the frame. I am happy with my inspired frame. I stenciled the back with a Show Offs stripes stencil from Hobby Lobby that is no longer online. Maybe available in the stores. FrogTape Multi-Surface Painter's Tape would work for the stripes too. My inspiration frame was priced JUST RIGHT at $1.50.